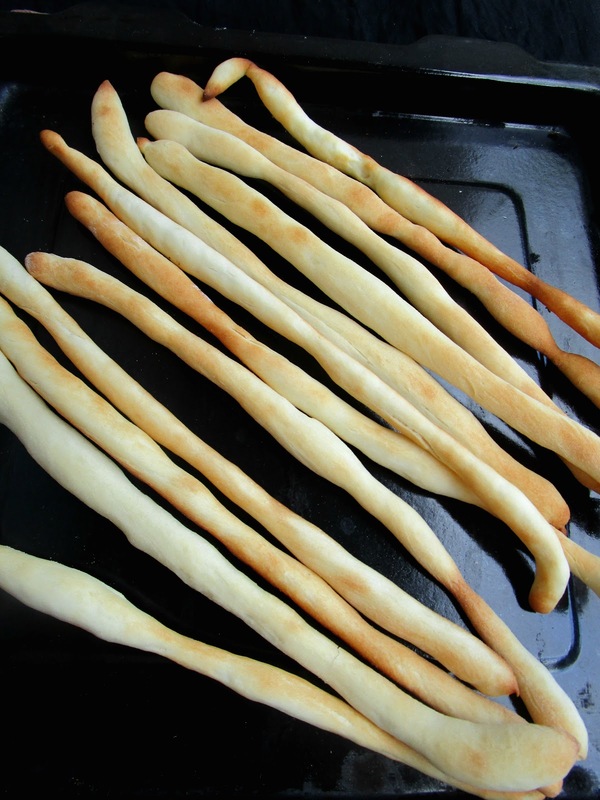 Grissini or Bread sticks are addictive just on their own or by any dips or soups. So make sure you make enough for yourself. The train journeys reminds of these bread sticks with butter and tomato soup. I've learnt, this is the proper way to have one : You first scoop the butter with the bread stick and bite into it and next sip the hot tomato soup. I wonder why, this way? But it's okay, you can have it the way you want it. 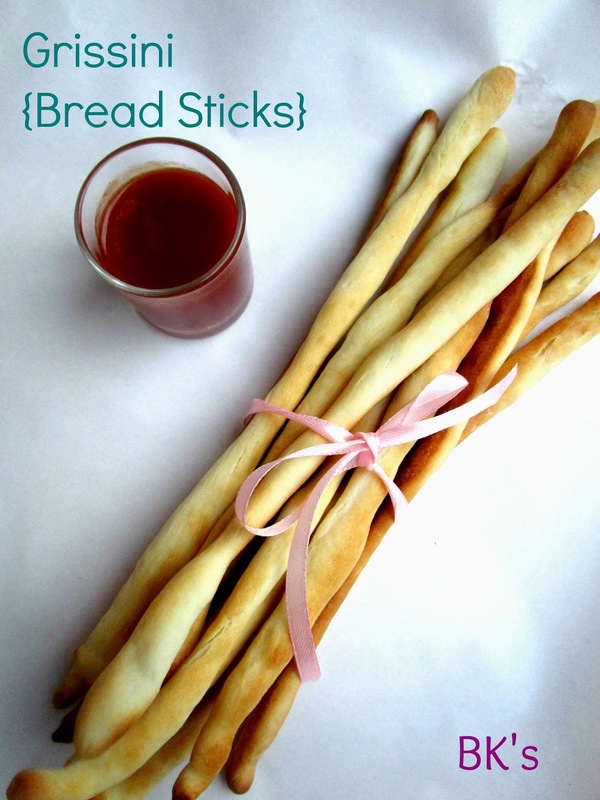 I eat my sticks with butter and tomato sauce. One could also dip into cream cheese, guacamole, chocolate fondue, cheese fondue or marinara sauce. 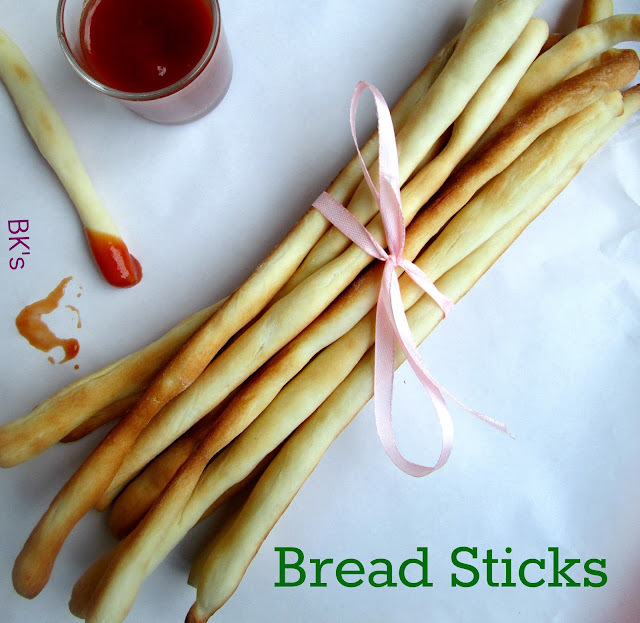 You could also add herbs, carom seeds, cumin to your sticks dough but I like them plain. You could also sprinkle poppy seeds or sesame seeds before baking. 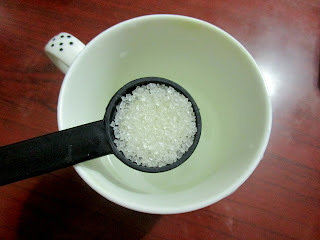 Brush some water and sprinkle them. 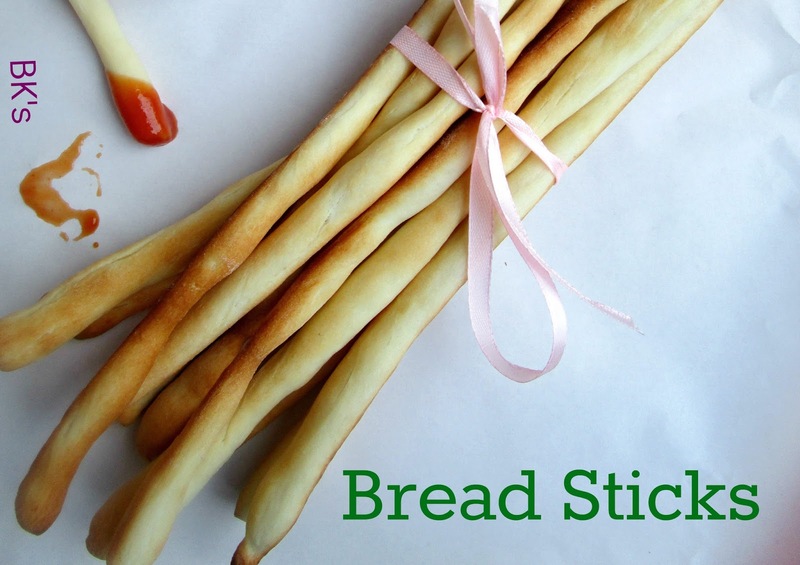 You'll have your own sesame or poppy seed sticks. 1. Firstly, add lukewarm water to a mug or a small bowl, followed by sugar and yeast. 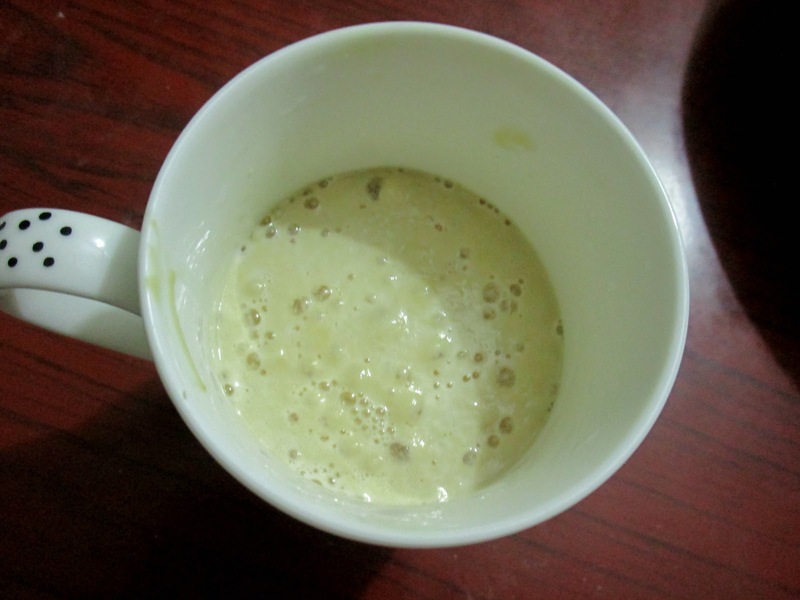 Mix well and set it aside for the yeast to froth up. 3. 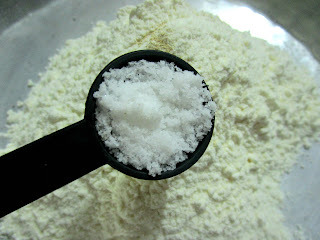 Once the yeast mixture is ready, add it to the flour and knead the dough for 5 minutes. 5. Knock back the dough to degas and knead briefly. 6. Shape the bread sticks. (Make small dough balls and roll the balls into sticks). But do remember that they will rise as they bake. So, roll them thinner than you actually want them. The thickness of your little finger always works. 7. Bake them in a preheated oven at 200 degrees C for 10 minutes. Each oven works differently, so keep an eye on your sticks. This will give crusty tops and soft centers. If you want hard centers, then turn down your oven to the lowest temperature and bake for further 5 minutes, just make sure you don't burn them or over brown them. This way, they don't go stale and can be kept for few days in an air tight container. and yeast. 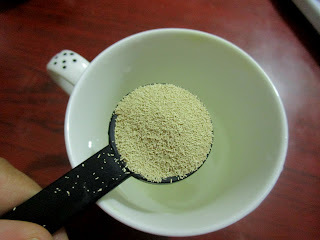 Mix well and set it aside for the yeast to froth up. Once the yeast mixture is ready, add it to the flour and knead the dough for 5 minutes. Rest the dough until it gets doubled in its size. Knock back the dough to degas and knead briefly. Make small dough balls and roll the balls into sticks. But do remember that they will rise as they bake. So, roll them thinner than you actually want them. The thickness of your little finger always works. Bake them in a preheated oven at 200 degrees C for 10 minutes. Each oven works differently, so keep an eye on your sticks. This will give crusty tops and soft centers. If you want hard centers, then turn down your oven to the lowest temperature and bake for further 5 minutes, just make sure you don't burn them or over brown them. This way, they don't go stale and can be kept for few days. 1. If you roll out thick sticks, you'll get soft bread sticks. 2. 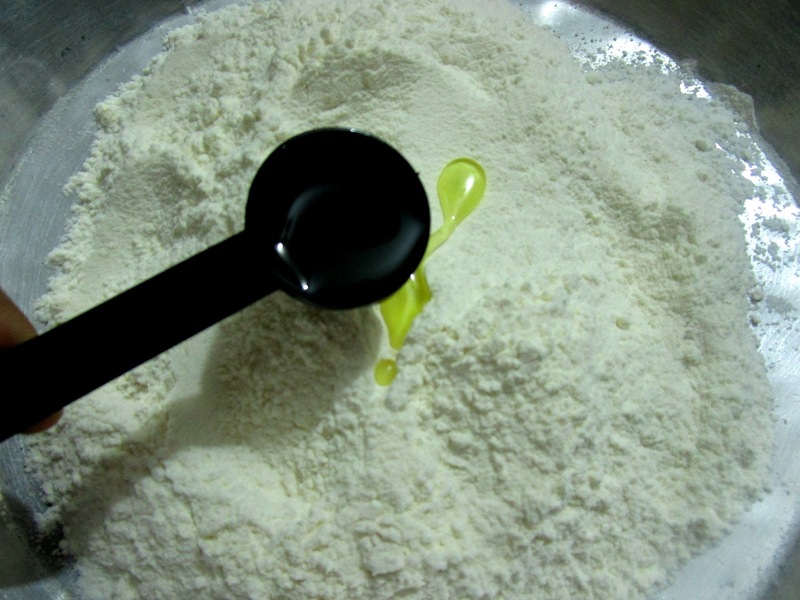 You could add few more teaspoons of oil during kneading the dough. 3. Water can also be adjusted accordingly. 4. You could use herb or garlic infused oil in the preparation of bread sticks dough.